The table consists of a recently re-leathered black leather top with blind and gilded tooling surrounded by a mahogany cross banded edge. This leads down to a moulded edge with a frieze below consisting of one mahogany lined drawer and three dummy drawers to give the appearance of a drawer on all four sides. Each drawer front is cockbeaded with a brass swan neck handle with cockbead decoration to each side of all drawers. To the top of either side of each leg is a finely carved scrolling bracket consisting of flower and foliate decoration leadng down to the moulded tapered legs with a moulded collar below and terminating wih a spade foot. 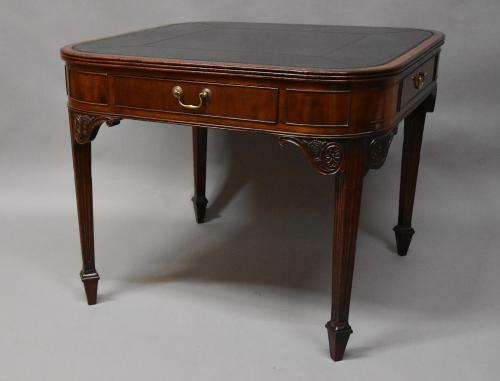 This table is in excellent condition for age, is of stable construction and can go straight into a home or office.